James Leroy Hicks, 81-year-old Vinita resident, went to be with the Lord on Friday, March 23, 2018 at the St. Francis Hospital in Tulsa. He was born on October 12, 1936 in Mountainburg, Arkansas to Herman Raymond Hicks and Myrtle (Purdue) Hicks. 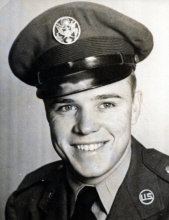 James was a retiree from the United States Air Force as a Senior Master Sergeant, he served from 1954 to 1977. He was involved in both the Korean and Vietnam wars. After retirement from the Air Force, James worked for the Multnomah County Department of Corrections in Oregon for ten years. He married Carrol L. (Lowery) Hicks on August 17, 1985 in Salem, Oregon. They moved back to the Vinita area in 1995. James loved animals, dogs and horses, he and Carrol had many miniature horses they raised. He also worked for the Vinita Fire Department and had the Vinita Fencing Company. He was a member of the Emanuel Temple Church and attended Cowboy Junction Church. Preceding him in death were his parents, siblings, George, Lloyd, Herman and Lonnie Hicks. The family includes: his wife Carrol of the home; his children, Teresa Hicks of Vinita, Tracey Allen of Boswell, OK; the mother of his children, Jolene Hicks of Vinita; siblings, Lawrence Hicks and wife Susan of Salina, Opal Evans of Spavinaw, Tony Hicks of Warner-Robbins, GA, Berdina Cleveland of Muskogee, Darrell Hicks of Texas; grandchildren, Austin Hicks, Anna Allen, Abigail Allen, Ruby Allen, and Jordan Allen. The family will receive friends from 6-8 PM on Wednesday, March 28, 2017 at the Burckhalter-Highsmith Chapel in Vinita. The celebration of life service will be held on Thursday, March 29, 2018 at 11:00 AM in the Burckhalter-Highsmith Chapel, with Pastor Bruce Butler officiating. Interment and Military Rites will be held at 3:00 PM Thursday, March 29, 2018 at the Ozark Memorial Park in Joplin, MO. Arrangements are by the Burckhalter-Highsmith Funeral Home of Vinita.